Escalation is a systems archetype that occurs when competing actors “one up” each other – rather than set absolute levels of behavior, each actor observes the actions of a competitor and responds relative to another. This can lead to a damaging spiral if the escalation involves violence, hate, and negativity. 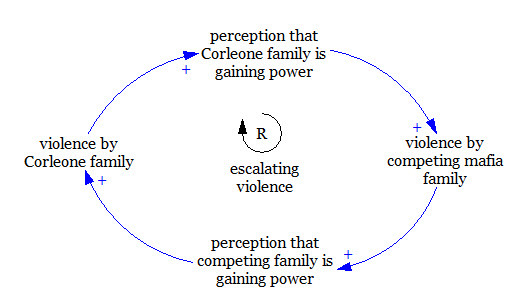 In the Godfather movie, we watch the Corleone family get vengeance on other mobs through killing. Each side is stuck in a war of revenge as key characters die off. Competitors engage in price wars where each tries to undercut the other, until they are both pricing just above costs and making much less than they would have had they not undercut in the first place. Gossip and noise levels in groups of friends can escalate. Political candidates escalate the amount of campaign money spent on negative publicity of their opponents. In the 90′s rappers would have “beef” with each other, creating East Coast vs. West Coast rivalries that escalated into hate-filled lyrics and violence. In 2011, an Amazon textbook of Making of a Fly was selling for $23,698,655 because two companies each selling a copy of that textbook had built an algorithm that pegged its daily selling price to that of the other competitor, plus an upward adjustment. Each company did not know that the other was also basing its price off itself; what ensued was an amusing month where the prices jumped from $1.7 million to $23 million in one month. Escalating in a positive direction can also lead to negative consequences. Some people view environmentalists today as being too extreme and rigid after observing the escalation of environmentally-friendly lifestyles. When every one at work wants to be a top performer, we see escalation in the intensity of the job and an increase in the number of work hours, leading to a culture that is overworked and burnt out. Escalation occurs because there is a reinforcing loop between two or more actors. This can lead to exponential growth, pushing the actors quickly to their limits. Eventually, someone or something will break down and end the escalation. One way to escape is for every one involved to agree to stop. Companies recognizing that undercutting prices leads to less profit for all will have to play nicely and stop undercutting each other. The Amazon publishers, after seeing the unreasonable prices of their textbooks, will redesign their algorithms to avoid future situations like this. Because it can be difficult for actors within an escalating system to completely stop something they’ve been engaged in for some time, it may require a third party to enforce an end to escalation. For example, government can set limits on the amount of campaign spending money politicians can use. Parents can enforce time out rules if arguments between siblings escalate out of control. Such a good archetype – happens in so many places in society, although sometimes it’s hard for the parties involved to realize that they’re part of this reinforcing loop. For the Amazon example – so was it the companies selling the books that built the algorithm or Amazon that built it? Yes, I think escalation is one of the easiest to identify since people create it everyday at work. Those were independent booksellers that both listed the same textbook on Amazon. The fact that the price escalated to that degree indicates that the people in charge of designing the original algorithm thought that their roles were in creating a formula and not in monitoring the performance and data of the product. This can point to some of the downsides of relying on computer models to design our pricing/buying strategies. This is great! You are explaining mathematical constructs like positive feedback loops, their dynamics, and their inevitable and powerful connection to real complex systems in a very simple and lucid way! Much theory has been generated by mathematical modeling of complex systems and I often think that it is not put to use in understanding/solving our real problems. On escalation, I think that information flow (between two nodes, that they are reinforcing each other) could be an early barrier in recognizing/predicting escalation.